Finally! 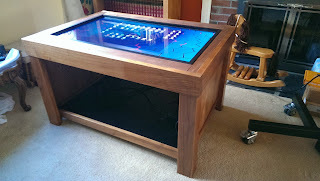 A coffee table build using a 40” Monolith in an all maple wooden enclosure. This one lives in my house. I find it funny how often I've built systems, built prototypes, and rarely have a fully assembled unit at my disposal for experimentation. 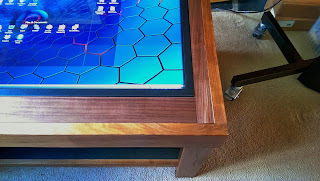 A friend of ours fabricated the adaptive top portion onto our old Geek Chic prototype table build from the Locus days. 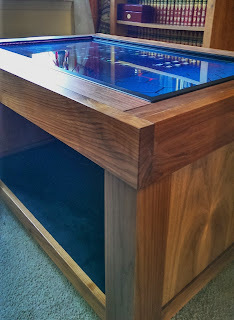 The construction is all maple -- Geek Chic scrap and prototyping is still better than most purpose built tables. The Monolith sits fairly flush to the surface wood. It protrudes just enough to keep a smooth edge to edge transition from wood to metal. The total build cost for this unit as a one-off custom build would be roughly 4600.00 USD -- not bad really, but still pretty high. Right now the PC and cables are just tucked underneath on the lower shelf. This will all be attached to a mounting system I’m hanging on the right hand inside wall. Easy to access but out of the way and visually clean. The result is a quick and dirty interactive coffee table. The table design is such that the LCD hangs from the metal enclosure which clamps the touch and surface glass components together. The Monolith itself is held up on a small lip that exposes all of the inputs and output as well as the vents for the LCD—this allows for adequate ventilation and support for the metal enclosure which in turn carries the weight of the LCD and glass. 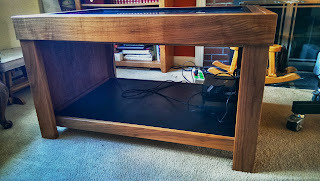 The short sides of the table are closed to allow for space to build our PC box and manage cables into a single exit point. The PC box will be movable from the right end to the left end in the event that I want to alter where the power cord exits the system without having to flip the LCD screen. Straight direct touch with no cover glass over entire unit. The Monolith surface glass is still present so touch actions are not occurring directly on the LCD. 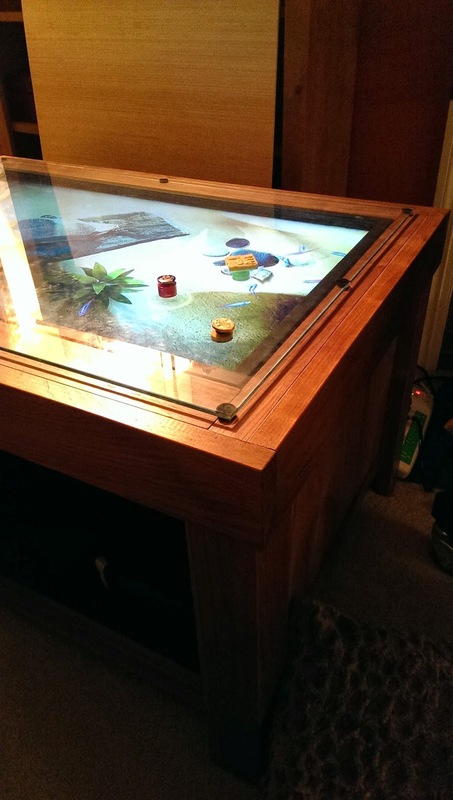 Recessed screen and edging which allows for a top to be added to the unit which hides the touch screen until it is needed, desired. This build results in a slight drop after about an inch from the edge when the touch screen is exposed. 1/4 inch tempered glass topper. 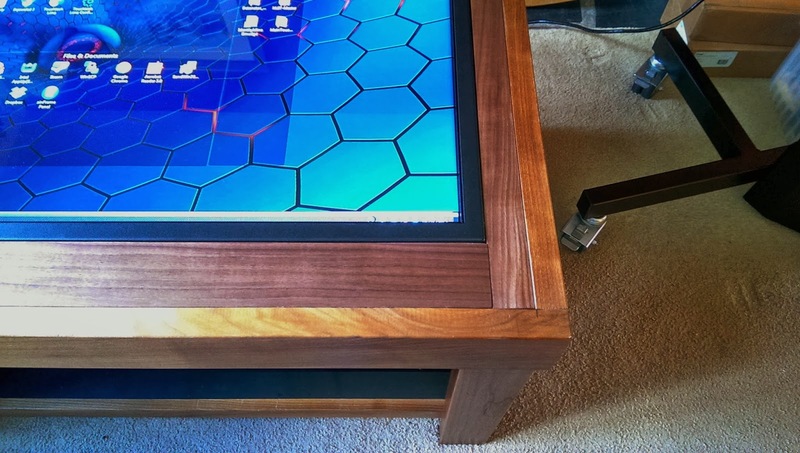 This top allows the screen to be seen and used via keyboard/mouse or through the use of magnetic markers which are placed under the glass and then moved with a second set of markers from above. I’m working on a small collection of markers with different properties, right now I have some thick ones and some thin ones. The thin ones should allow for button like actions as they can be lifted out of the range of the touch and then “dropped” to create touch actions—however, right now, these thin ones will stack if they are brought over each other—work in progress. Below is a video showing basic interactions with my first pass test of thru-glass magnetic objects, Alea Magnetic Markers and Refrigerator Magnets! The idea is inspired by the magnetic box toys you see at various science and childrens museums. The external markers can be any object with a nice strong magnet in it, such as a toy truck. The internal markers can be smaller cylinders or less obtrusive objects. The basic idea would be an interactive software that the physical, external objects interact with by manipulating the various "tool-tips" active in the application. The application featured is the Windows 7 Touch-Pack Lagoon screensaver -- still a favorite on my older test systems. 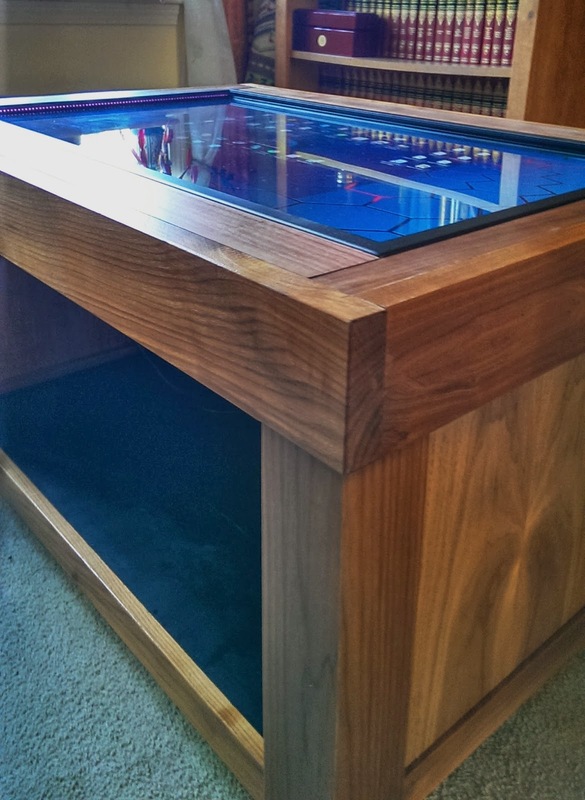 A final build would use glass that runs edge to edge or acrylic that hooked around the long edges. Additionally, I’d use clear stand offs rather than the black PC feet which I seem to have an endless supply of.. The key observation from this weekend experiment is that my kids love it! They have been having a great time moving the pieces around and seeing the interaction with the water and the fish. They're not new to the screensaver, but the physical objects certainly renewed their interest. The Lagoon screensaver has a neat feature where a touch event left in place causes the fish to gather and "nibble" at the touch point. In a traditional installation, a user has to hold still and let the fish come up to them. I've shown Lagoon multiple times at conventions and shows over the years and usually have to demonstrate this element. With the static markers, the fish always come out to play when the screen is idle -- a very interesting change in behavior and thus, expectation. My kids are fairly young, they have a hard time holding still long enough for the reward of a finger surrounded by fish. Using these objects, they simply had to -not- touch anything for a few moments to enjoy the arrival of our skittish friends. As time permits, I will continue to experiment with this table configuration and post my observations. PAX East, Monolith Product Launch, and What's Next? Our Monolith touchscreen launch this weekend at PAX East was a big hit. The level of interest from the attendees and exhibitors was amazing. In response to the overwhelming interest and enthusiasm, we are extending the introductory show price for next two weeks on all of our Monolith Series displays. Also, due to the overwhelming response, we've reduced the X Slim and A Series touch overlay prices permenantly! PAX East here we come! This year's PAX East should be very interesting. We have some new products to show as well as new software. We will have some special guests at our booth; the d20Pro lead developer and two of the brains behind Machine Code Games. Pick up your swords and spears, we have d20Pro demoing with a playable, mini arena scenario. This is a quick intro to d20Pro setup which will be played directly from the booth, so stop on by! Machine Code Games is getting their casual gaming on with a collection of games available for play on many of our touch screens. There will be space for sit-down, casual board gaming with these talented developers. 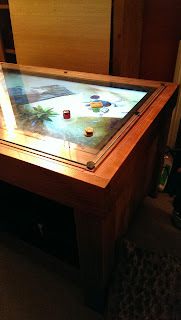 Last but not least, we will be debuting our newest edition to our multitouch touch screen line up. We will have two of our new and improved touch screen systems on hand. Help us name our new product line by submitting your ideas into the proverbial hat! We will be offering various show specials and events throughout the show. Stop by often or follow us on twitter Follow @mesamundiinc . Stop by Booth 380 at PAX East for engaging multitouch gaming experience as well as our show discount. Two big updates from the ZaagTech world. The first is the X Slim Series frame. This 19 mm wide IR Multitouch Overlay has a very "slim" bezel width. The height from the touch surface measures in at 10.8 mm. Keep in mind that with all of these overlays, whether their from Baanto, PQLabs or ZaagTech, you always need to add in the thickness of your adhesive and/or touch surface/acrylic. As a means to minimize added height ZaagTech includes a new selection of 3M double sided industrial tape. This new material is grey and squishes down quite thin, adding no more than .25 mm - .5 mm. I've had a lot of success with the material on attaching to both plastic and metal. The performance on the X Slim frames are amazing. Even at the higher touch counts, I've been seeing response times similar to the 2 and 4 touch frames. I'd like to talk about the second bit of news that came out of our friends at ZaagTech recently. The introduction of the new frame brought with it a new iteration of the ZinFrameServer application -- Version 5.5.x. The key change is the way this tool set runs on the installed system. First let me state that for the purposes of this article, I'll be specifically discussing the Windows version of the tools, as the Mac tool is still a separate animal and has not changed all that much. First off, the driver runs as a Windows Service. This is key for allowing the frame to operate at the log in screen level. The system-tray option is still accessible so the service is easily managed from the desktop. Additionally, this version of zinFrameServer is exceptionally good at switching between frames in a multi-frame configuration. Interesting additional data is now visible via this tool. You can see what version of hardware you're running off of, as well as seeing what type of frame configuration you're working with. Another neat feature in the new tool is an automatic pairing of touch frames. If you connect more than one touch frame overlay to a single system running v5.5.1 or better, you'll see a drop down containing the serial number for each frame attached. You can switch between these frames and enable TUIO, HID, Flash, or any combination of these independently for each frame! Full Windows 7 and 8 touch support is implemented with this most recent driver update. Happy new year from Mesa Mundi! As a means to ring in the new year, we're offering a $50.00 off coupon for orders over $200.00. Simply use code NY2012 at checkout. This discount is additive with any offers or discounts currently being provided but is only good for purchases made between now and Jan. 2nd 2013. 5 New Machine Code Games Titles Launched! We've launched 5 new games today in conjunction with Machine Code Games. The Battle Home: A Pachisi Game - This is very similar to the classic Parcheesi board game of yore. I’ll admit I’ve lost of a lot of time to testing and retesting this game—not all of that time loss was due to a _need_ to test, if you know what I mean. The game can be played with up to four players independently or on teams. 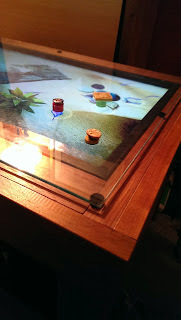 The default install includes two game boards, a square one and a “plus” shaped one. There are lots of play options and game play itself is easy to manage as the game seamlessly guides you through valid moves. The AI is remorseless. Fas’Jack - This one is Blackjack for 1 - 10 players. The AI is pretty solid and the players play against the house so hiding your cards is not required. The game plays in 10 rounds with the player with the highest stake winning the set. Each round, every player is awarded a $5 bump in their stake so no player is every knocked out of the game entirely before the 10th round ends. Fun for casual as well as serious blackjack fans. Bloody Hearts - This one is a redux of the classic card game Hearts with a darker twist. The art and appearance of this one are ominous. The game can be played with touch only, but exposing and selecting your cards can be tricky in this mode. Ideally this game is best played with cardboard blinds to obscure your hand from your foes...er… opponents. A solid translation of Hearts, this game can be played by 1 - 4 players singly or on teams. The AI is quite good at the game. GotIt - A frenetic shooter game, GotIt is a 1 - 4 player game where you fire beams attempting to destroy an invading infection. The mechanic is simple. You’re one of 4 corners of the screen. Your space can fire several beams at the same time, but every beam costs you battery. When your battery is depleted you cannot fire. Your battery recharges. There are point targets, power ups and power downs. 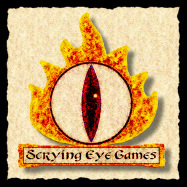 Fun, quick paced, but definitely a game that is better played with others. Pair Soup - Matching game for 1 to whatever players. The only real limitation for players on this game is number of track-able touch points and screen size. I’ll be honest, I keep trying to not like this game but I just can’t do it. The concept is simple, a slew of preset silhouettes pop onto the screen and you and your friends attempt to match all the pairs. When all available pairs are matched more pop onto the screen. Each “round” more and more objects appear and not all objects that appear will have a match. Addictive and straight forward. The game supplies three modes of play currently. Each mode is based on the shape selection. The “Basic” mode is colored shapes that are mostly animal, kid friendly shapes. The “No Color” option are shapes with no color… very tricky. The “Skulls” mode is a vast selection of skull-like shapes that introduce a collection of not-immediately-recognized objects. For those of you familiar with Machine Code Games, these new titles are compatible with the free MCG Application Launcher. Additionally, the games offering the ability to modify the art assets once installed. For instance you could easily modify Pair Soup to add custom art in place of the skulls or bunnies collections. We've also created a value bundle for these games located here. 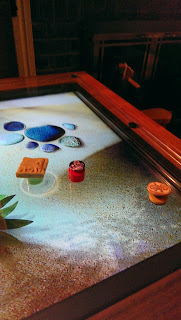 We've discounted our entire line of Multitouch Solutions for the 2012 holidays. Visit our solutions center to check out the reduced pricing now! Attended the Consumer Engagement Technology World event in New York City today. The event caters to public spaces and direct customer interaction through the use of technology. Certainly something quite relevant to the touchscreen and multitouch industries. There was a decent turn out for the convention, however, there were two similar conventions being held in the same convention center next door. I think that perhaps we were a bit under attended due to the higher stature of the neighboring conventions. Still there was a lot to see and do. The floor was an easy walk. Layout was straight forward and the overall size was rather small. The focus of the exhibitors was split between hardware and software fairly evenly. The main differences were in the directions the hardware and software vendors were going. A large number of the software vendors offered <*>-to-mobile services. Customer is selected by X criteria and sent a mobile campaign via text, sms, and/or email. This is one of those tricky topics for me. I'm not personally someone who likes getting a lot of text messages or solicitations. However, there were some novel solutions to setting up these lines of communication. There were a handful of kiosk/poi/pos type software systems on display. Some of these would lend themselves very well to the touch segment. One in particular was a digital concierge product that, while not the most attractive, was certainly feature rich. Possibly the most interesting of the software on display was a facial recognition application that did customer/person tracking across a given space. It would link customer/person actions with a data base and immediately let the controller know if this person had a special record -- good or bad -- that should be taken into account. When I walked up to the booth, I saw several images of myself appear on the screen, some of these were recent shots from my approaching of the booth. Other images were from earlier in the day when when I happened to walk near their booth! Once I got over the creepiness factor, I began to really appreciate the cleverness of their system. All in all, much networking was done, and the show was a success from that stand point. However, I doubt I'll bother attending again, unless they resolve the scheduling so as to not conflict with other major events of similar ilk. ZaagTech has launched their newest addition to their product line. An X Series frame which sports the lovely additional feature of being extremely thin! This new frame measures in at roughly 19mm wide, versus 36.5mm, while preserving the 11mm height from the previous X Series frames. In addition to this new dimension, the frames use a new connection setup which places the screws on the outside edge of the corners. The new screw setup, 4 screws per corner, allows for a much stronger bond than previous models. Like the standard X Series frames, the new X Slim are jacketed in black extruded aluminum. A single USB connector hangs from the lower right (when facing the frame) corner of the device. The frame is advertised as offering 2x the speed of it's predecessor. We'll have to run some tests to determine if the product can delivery on this claim! The overall look and feel of this new frame is rather nice. The things that I noticed immediately were the rigidity of the corner connections and a significant thinning of the lower edge. In previous versions of this frame the interior edge had the same sized lip on the top and bottom, this new frame has virtually no lower lip to the IR window. This should allow for the frame sensors to sit very, very close to the touch surface. Another post should be coming shortly where we'll run some side by side comparisons with some of the other frames.